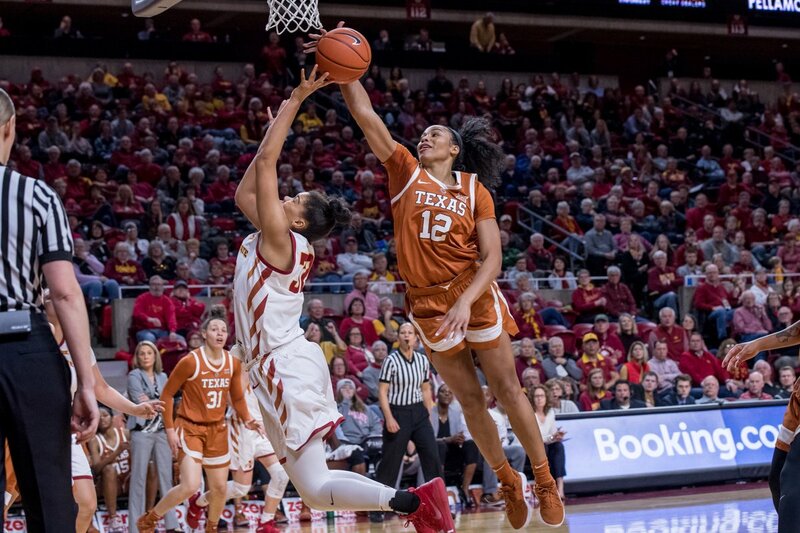 The Texas women’s basketball team swatted away a comeback attempt by Iowa State for a big road win, 64-62, Saturday to improve to 4-0 in Big 12 play (photo courtesy of texassports.com). AMES, Iowa — With a huge game from guard Sug Sutton the No. 11 Texas women’s basketball team snagged a big win in a showdown with No. 20 Iowa State Saturday. Sutton played all but one minute of the game as she soared with 24 points and added 10 rebounds, while dishing out seven assists to boost the Longhorns to the narrow 64-62 victory in Ames, Iowa. Texas (14-4) is now 4-0 in Big 12 Conference play with the win. Jatarie White pitched in with 10 points and seven boards while Danni Williams added 10 points, six rebounds and two assists in 37 minutes of action. Joyner Holmes also had a solid all-around game with eight points, seven rebounds and two blocks in the victory. Iowa State tied the game at 56-56 with just over four minutes to play, but Texas was able to hold off the Cyclones thanks to a late jumper from White and a defensive stand to keep the lead. The home team had a chance to win or tie the game but Holmes had a huge block of an attempted layup by Alexa Middleton and a missed shot by Bridget Carleton as the buzzer sounded. Now Texas will hit the road again to play at Kansas State Tuesday at 7 p.m.